It won’t allow me to change my very long used for AppleID non Apple email (which I do not use any longer) associated with my account to my only used now email from iCloud. I get a message saying an iCloud email can’t be used. Apple doesn’t allow iCloud emails to be used for this? It would be constructive and it makes a difference for some users to distinguish between the apple ID for iTunes and apple.com and the ID [that may be different] for iCloud. A clear exposition of this distinction would be most useful. No, there is no way to merge two Apple ID accounts into one. Pick one account and use that exclusively if possible, it will make things easier. 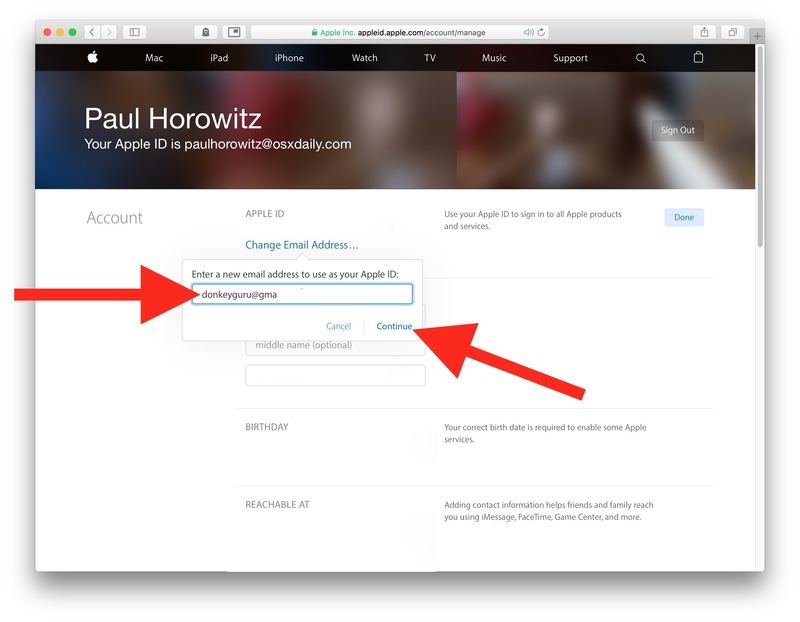 Changing an Apple ID can be vey frustrating as can changing the email address associated with one, it is not recommended if you can avoid it. I wonder if you can link an old Apple ID and old email address to an existing Apple ID’s email address? Not sure if this is exactly what John Z is requesting? I want to terminate 1 Apple ID rather than form a link. I ‘unfortunately’ have 2 Apple IDs. This came about when Apple Forced changes upon users, so I do not want to make more changes and gain another Apple ID. My early purchases are on the ID I started out with and my later purchases are on my new ID. Even if I could get a list of the Apps on each ID it seems ‘crude’ to have to resort to crib sheets? Will Apple allow the Original ID eMail Address to be changed to the Existing New eMail Address? I have the exact same problem. I would love to be able to ‘merge’ the two and just have a single Apple ID! I did ask the question a year or two ago and was told that it wasn’t possible… Does anyone know better? Paul? “change email address” is not available under EDIT…? Thanks for this info. I want to strongly support your recommendation not to change your email address associated with your Apple account unless you really have to. I had to change my address, and it required a long call with Apple support in order to straighten out iTunes, iCloud and the three computers and two mobile devices associated with the account. Until Support pitched in, the hardware was not being recognized by Apple for updates, etc. and accessing iCloud was blocked on some of them. NO iCloud and any other clouds for me. Apple has become like Google – both have taken control over your email, applications…etc. About 2 years ago, I changed the ID. I entered a period I called “Apple ID Hell.” I wasn’t the first. Googling the phrase found me a long tale of woe on some blog. The problem occurred because I have a desktop, iPad and iPhone. I thought the change would ripple through to the iPad and iPhone. At worst, I’d have to change all three. But it was worse than that. I finally called help. It seems that to change the ID on, say the iPad, you have to carry out a long list of directions. When I saw how simple it looked on the desktop, I had no idea it was different on these other devices. Also, if you tried to fiddle with it too many times, you were locked out for, I think, 24 hours. The help Center told me to change back to the old one. Then, go the other devices, being sure to follow the list of directions. Finally I got all three in synch, but it was a nightmare. Why doesn’t the “change your email” screen on the desktop warn you that if you have other devices, you must prepare them for the change to. A link to the list of instructions for the mobiles would have been a huge help. One of many reasons I would not recommend changing an Apple ID or the email address associated with one. Just because you can do something doesn’t mean you should. People can jump off a cliff, but should they? 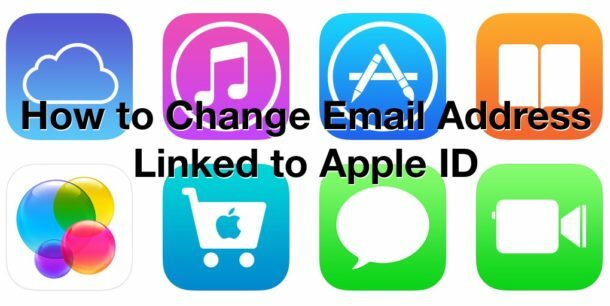 From the get go, use an email that you want to use permanently for an Apple ID, if you change it and have multiple devices there can be many problems! Why is my comment gone? This is important. You haven’t made it sufficiently clear about how you need also need to do all your devices at the same time. Changing it on the mobiles was quite a bit more involved. I had a DREADFUL time with this. Also, the help Center (that I was forced to call) told me the email WAS the Apple ID. Maybe they were just to simplify things. Thanks for mentioning this important point. I found out 6 months ago by trial and error that this was true. I had to log in with the old ID and then log out once and for all in order for the new ID to work consistently. Mine can’t be edited. Any reason why? Perhaps your using @me.com or @icloud.com domain. 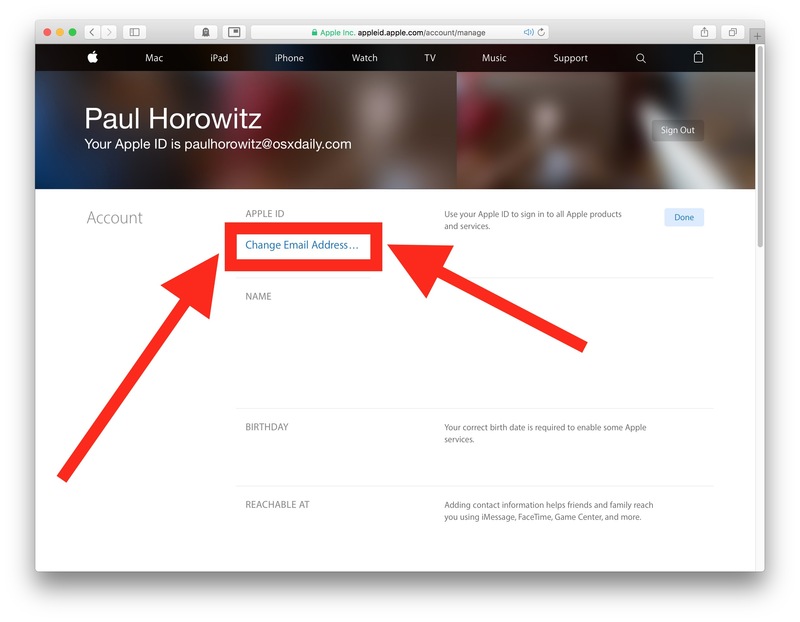 In these cases Apple don’t let you change your Apple ID email address. I have 4 emails linked to my same Apple ID. 2 personal, 1 for work, and 1 for university. As a result they can all FaceTime me whichever email they know. I also have 2 phone numbers linked to the same Apple ID. WHEN I try to edit my email address it tells me there is an unknown error and I can’t i cant do it at this time. what do I do? I really wish you would do a piece specific to Verizon’s exit from their email service effective May 2017. My Apple ID was a Verizon email. Now I’m scared to change it, but know that I have to do so. I have the same problem as Emy. I also had a Verizon email address which I thought was permanent; but since Frontier took over I no longer have that address and Verizon has exited the stage. I had to change my email to my Yahoo address to receive my emails. My Apple ID still has the Verizon login but it does not acknowledge the Verizon password any more. I can’t access iTunes; iCloud or any of the other services Apple offers. I need to update my Apple ID to Yahoo but am hesitant to proceed without expert assistance. It doesn’t allow me to change my email address only allows me to add more/or another one. I really really want to change it I get to many suspicious emails that I’m constantly send/forwarding to abuse@icloud.com. It’s making me crazy. I love you Apple but these spam emails are killing it for me. When K check my Apple ID in Settings it has the correct one. When I want to update Apps it asks me for the password for a passed account. I don’t have this information and it gives no options to create a new password. I went to https://appleid.apple.com/ on my laptop, signed in with me now Apple Id and it worked. This ID and PW are associated with my laptop and iPad. I tried to create a new ID and PW in iPhone Settings but it only tells me the email is already used for Apple account. How do I remove a very old Apple ID from my iPhone, even though it shows up nowhere except when I try to update my Apps.